Many thanks to Dean Stahl of Steelhorse Studios for the superheroes artwork! In a tragic supermarket accident, Jakob Utensil was buried under a collapsing mound of spatulas. Emergency crews declared the situation hopeless, but before their very eyes, Jakob dug his way out, having absorbed the uncanny ability to use spatulas to flip objects out of the way! Turning his newfound powers to fighting evil, Jakob became Captain Spatula, leader of the League of Good Guys. After watching Jurassic Park for the 3,000th time, young Johnny Raptor's brain chemistry subtly altered, absorbing the DNA information from the big screen and integrating it into his own molecular structure! His body mutated into a half-theropod half-boy, capable of fantastic feats of dinosaurian ability, such as subsisting on raw meat, playing tunes through his nasal cavity, and figuring out how to open lever-style door handles. Malcolm Calcite was a physicist experimenting with laser refraction through various materials, when an earth tremor destabilised his apparatus and focused a beam of high-energy refracted laser light on him! His body reacted by turning permanently transparent and totally internal reflecting the light. He can now change his refractive index at will, bending light and creating cool rainbow effects, but cannot set it to exactly 1 so that he is actually invisible. While working at a commercial earthworm farm, Andy Annelid slipped and fell into a vat of worms. His primal screams of terror had a psionic influence on the worms, and they moved willingly away from him! Now, simply by concentrating, he commands the loyal service of worms of all types. The worms follow his direction, but gain no special powers such as increased speed, or toughness, or ability to withstand dry environments. On safari in Africa, Maximillian Waterhorse, third Earl of Taweret, was pushed by a native porter into the Zambezi River downstream from a new nuclear power plant. Struggling for his life, he was bitten by a radioactive hippopotamus! 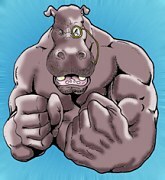 Left for dead by his safari group, he slowly recovered, while transforming into an immensely strong half-hippo man! He swore vengeance on the person who pushed him, but couldn't remember who it was, so now targets his wrath at anyone. Captain Karl Nein of the merchant ship Daft Poodle was busy unloading some contraband that he was carrying to make some extra cash, when he fell into the water with a crate of dog-derived steroids. The chemicals reacted with his body and turned him into an anthropomorphic dog! 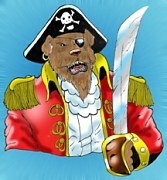 Now he is the scourge of the high seas in his new guise as The Sea Dog. He always talks in pirate slang. Arrr!! Messing with Secrets Man Was Not Meant To Know, taken from an occult book rumoured to have been written in ancient Atlantis, Professor Arthur Gefilte was convinced that he could achieve fantastic power by throwing himself off the Rock of Gibraltar into the Mediterranean. He drowned, but his spirit lived on in corrupted form as Aqualich! He indeed gained great powers, but because he is now dead by drowning, they are restricted to controlling dead fish. 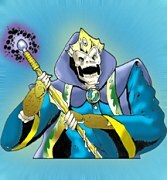 Aqualich is de facto leader of the Axis of Antagonists. Computer expert and amateur entomologist Archy Mehitabel was debugging some code one day, when a cockroach darted across his keyboard. Slamming his fist down hard to squish the bug, he hit a sequence of keys that caused his computer to explode. 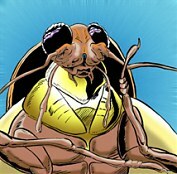 When he came to, Archy had transformed into a giant roach! Now, as The Bug, he takes revenge against society and the computers that run it with his incredible 1337 h4xx0ring 5killz.